Live crab need to be kept cool and damp 8-10 hours if possible in prime conditions. Do not submerge in water, crabs need oxygen to breath! Once crab dies they must be cleaned within 2 hours before the meat deteriorates. Cleaned, gills removed, guts out, uncooked crab can be stored in fridge up to 24 hours before cooking. Bring salted water to boil, drop crab into pot. Crab whole - 12 minutes. Cleaned crab - 7 minutes. Run under cold water to stop cooking process. 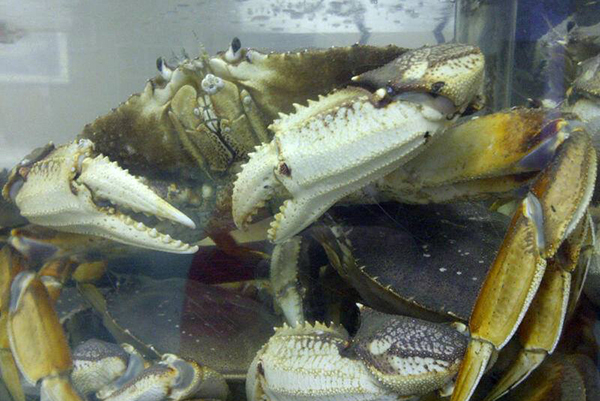 We recommend for maximum freshness consume or freeze cooked crab within 2 days. Cleaned and ready to serve as is or perfect for grilling or roasting. Hailed by many chefs as the finest crab in the world... our fresh live Dungeness Crabs are wild caught right here on our west coast. Dungeness Crab has a rich buttery taste, sweet right out of the shell, it's no wonder why Dungeness Crab will tempt even the trendiest of King Crab connoisseurs. Excellent steams and cracked, in a bouillabaisse or ciopinno. Fresh or frozen, enjoy our hand picked sweet, succulent crab without the hassle and mess! Fully cooked and ready for use.